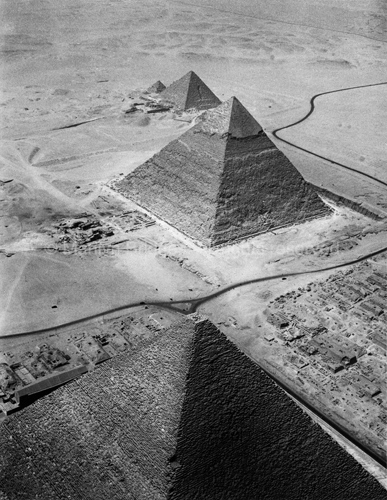 Three Pyramids of Giza, 1984. Three Pyramids of Giza, 1984. The three pyramids of Giza, built during the 4th Dynasty (2575 - 2465 BC) represents the apex of pyramid construction. In the foreground is the Pyramid of Khufu, who reigned 2551 - 2528 BC. It stands 480 feet in height, and like all of the pyramids of Giza, it is oriented to the four cardinal directions, with its entrance on the north side. To its immediate right is the western mastaba field, with the remains of hundreds of freestanding, rectangular tombs of notables and functionaries. Next is the Pyramid of Khephren (2520 – 2494 BC), the second largest of the Giza pyramids at 470 feet. The third pyramid, rising 215 feet, is the smallest of the three and was built for Menkaure (2490 – 2472 BC). The small pyramid to its left is the tomb of one of Menkaure’s queens. All of the pyramids have a core made of local limestone faced with fine limestone from the east bank, still preserved on the upper third of the Pyramid of Khephren. The lower portions of the casing of the Pyramid of Khephren and that of Menkaure consisted of red granite.